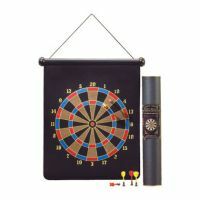 By offering solid construction of rubber, steel, and velvet, the Magnetic Dart Board is a fun game that can be enjoyed by both children and adults. Complete with darts, this toy is the perfect bonding activity for any family. Ages 3+.